It is the last day of the year and, rather than doing a roundup of all major and most beautiful stories from 2016, here's a suggestion for you – (re) watch Sunset Boulevard (1950). Yes, a noir film may sound like a bleak suggestion especially after yesterday's colourful and festively joyous images, but this one has a lesson for the new year as well. Written and directed by Billy Wilder, the film featured William Holden as Joe Gillis and Gloria Swanson as the reclusive silent screen star Norma Desmond and Erich von Stroheim (Swanson's actual director) as Max von Mayerling, Desmond's devoted servant. There are also a few amazing cameos in the film, including Cecil B. DeMille as himself shooting Samson and Delilah, plus Buster Keaton, Anna Q. Nillson, and H.B. Warneras, as "the waxworks" or Norma's bridge friends. In the film Norma lives in a fantasy world, hoping to return at some point to the big screen. The hope strengthens when she meets by chance down-on-his-luck screenwriter Joe, who becomes her own script doctor. The star gradually falls in love with Joe, but disaster and madness are around the corner and, at the very end of the film, having lost touch with reality, Norma believes the cameras are there to shoot her own version of Salome. She therefore dramatically descends her grand staircase, closing with the iconic words: "All right, Mr. DeMille, I'm ready for my close-up." Norma lives in a gothic villa that from the outside looks as if it were falling into bits and pieces, but inside it is preserved in all its gilded and lavish splendor (a set designed by Hans Dreier). Her legendary mansion doubles up as refuge and worshipping altar to celebrity gone and to the egomania of an obsessive and narcissistic diva. In the film Swanson is a fascinatingly divine and sad character: her feelings, behavior, delusions and desires are embodied in her luxurious wardrobe designed by Edith Head. For the occasion the costume designer referenced the 1950s New Look (to show that fashion-wise the star had kept up to date with trends…), accessorizing it with glamorous and tinkling jewels favoured by the screen idol (Swanson provided suggestions for the designer since she had lived and dressed through the years that made Norma famous). 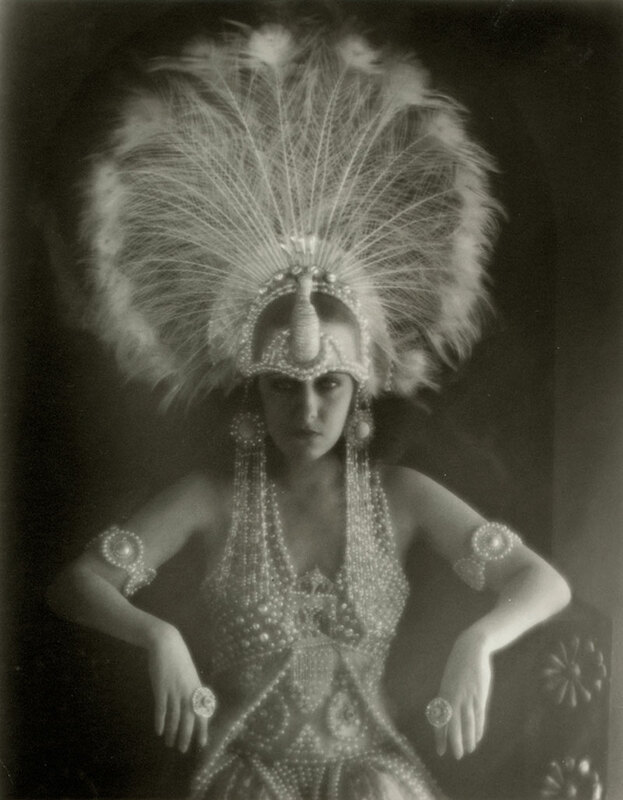 Head cleverly referenced Swanson appearing in DeMille's Male and Female, in which the actress donned a costume made of white feathers (from peacocks' in DeMille's ranch View this photo) by adding a white peacock feather on the hat Norma wears to visit the Paramount Studios. In the film there is also a very private and luxurious yet ominous New Year's Eve party, marked by Joe's final realization that the diva has fallen in love with him and by Norma's attempted suicide. There are deeper lessons behind this noir film: Hollywood promised Norma to make her legendary, but forgot about her, letting her cynically drown in her own illusions and mental disorder, so this is mainly a tale about fame. But it can be read also as a suggestion to forget the past, adapt to he present, and look forward to the future, rather than basking in old glories and be swallowed by them (sadly, though projected towards the future, as stated in a previous post, the fashion industry is a bit like Norma Desmond...). You can't erase a year from your life, but make sure you remember the lessons it taught you, then get ready to move on and, rather than letting the cameras linger on the past, let them roll onto the next scene, whatever it may have in store for you. Feeling festive at the end of a hard and challenging year can be difficult, but there are some wonderful inspirations out there. Watching films that put you in a good mood may be one trick and, since yesterday we suggested re-watching Singin' in the Rain, if you haven't done so, here are a few colourful images from it that should prompt you to sit down and relax for a couple of hours (or just stand up and dance while watching it...). These screen captures come from the section in which the characters have to face the transition from silent to sound movies, a change that has hilarious effects on the first talkie by Lockwood & Lamont in the film. Around this part there are severals second of fast, frenzied and fun images that look festive and visually striking. The shots are infused with joy and craziness, with sparkling glittery backgrounds and bright and bold shades and costumes. Guess these are the sort of pictures that get you out of bed, and make you feel ready to get into the festive mood for the next year. Enjoy them! These last days of December have been a long obituary session, in between Franca Sozzani, George Michael, Carrie Fisher and now Debbie Reynolds. The star died yesterday at 84 from a severe stroke, one day after daughter Carrie Fisher. Born Mary Frances Reynolds in El Paso, Texas, in 1932 the actress flourished after her contract with MGM. Fame arrived when, at 19, she co-starred with Gene Kelly and Stanley Donen in the musical Singin' in the Rain. She went on to star in a lot of film musicals, including I Love Melvin (1953), The Affairs of Dobie Gillis, Give a Girl a Break (both 1953), Susan Slept Here, Athena (both 1954), Hit the Deck and The Tender Trap (both 1955). She continued her career in film until she was in her thirties, becoming a cabaret performer, appearing mainly in Las Vegas and then turning her interest on television. She returned to the big screen in the '90s, whe she also bought a hotel and casino in Las Vegas, displaying part of her extensive collection of vintage Hollywood props, sets and costumes. Her museum relocated in the resort city of Pigeon Forge, Tennessee, but her collection – including more than 3,500 costumes, 20,000 photographs, and thousands of movie posters, costume sketches, and props (such as Charlie Chaplin's bowler hat and Marilyn Monroe's white "subway dress" from The Seven Year Itch) - was auctioned off when the museum filed for bankruptcy in 2009. It is worth rewatching Singin' in the Rain since this was the first film in which Reynolds had a prominent role (at the time she was an inexperienced performer and struggled to keep up to pace with Kelly's impressive dancing routines). The film, with its scene featuring Gene Kelly euphorically dancing in the rain while the lights magically turn the drops of water into silvery ribbons, was an ode to optimism (and who doesn't need a healthy dose of it at the moment? ), and fashionistas with a passion for costumes will remember that it includes costumes by Walter Plunkett (hair styles by Sydney Guilaroff and make up by William Tuttle). For the occasion Plunkett, who loved the realism of history, conjured up the flapper period. In the film Reynolds's performs a number in which she sings "All I Do Is Dream of You" with other chorus girls all dressed in a pink satin shortie accented with a gold braid forming a basket on one side that contained sweets and candies. The costume was accessorized with a close fitting cloche hat. Reynolds then dances with Kelly and O'Connor in the "Good Mornin'" number wearing a simple yet striking design with stripes of color across the bodice; when she duets with Kelly on "You Were Meant For Me" (with coloured lights and a wind machine to create a fake atmosphere...) she wears a diaphonous violet flapper dress with a capelet and matching shoes with bows. But there are plenty of flapper inspirations in the rest of the film, like the green foliage dress, so simple yet quite modern and poetical as well. Plunkett created pieces that rivaled the work of Travis Banton and Adrian and he's best known for Gone with the Wind, though he designed for many other movies, including Million Dollar Mermaid (1952) and Forbidden Planet (1956). But, for the time being, grab your copy of Singin' in the Rain and enjoy it. Influenced by the Space Age, designers such as Pierre Cardin, Paco Rabanne and André Courrèges tried to define in the '60s the fashion codes for the future. They created iconic garments and accessories in unusual materials, inspired by the shape of the moon, the astronauts' suits or the lunar palette, comprising the purest whites and the shiniest silvery tones. Yet for those of us born after the '60s, the fashion of the Space Age was represented by one main film character - Princess Leia from the original Star Wars trilogy. Her white floor-length robe and hairdo with massive buns influenced indeed more than just one generation of fans. Carrie Fisher, who starred as Princess Leia in the original Star Wars trilogy, called the buns "hairy earphones", "laughable Leia hairstyle" and "the hair of a 17th century Dutch school matron", in her latest autobiography The Princess Diarist, a light yet revealing read for every Star Wars fan, based on diaries she wrote while shooting the first Star Wars film in 1976 and chronicling the story of Leia on set and her love affair with her (married) co-star Harrison Ford. The actress and writer died yesterday at 60, while she was in intensive care, following a heart attack suffered on a transatlantic flight late last week while going back to Los Angeles from the European leg of her book tour. Fisher was the daughter of actress Debbie Reynolds and singer Eddie Fisher (who left his wife for Elizabeth Taylor when Fisher was just two). Debuting in Shampoo (1975), Fisher became famous after the first Star Wars film. She then acted intermittently (appearing in The Blues Brothers, Hannah and Her Sisters and When Harry Met Sally), working (uncredited) as screenwriter and becoming an accomplished writer, revealing her wit in her novels and memoirs, and writing about her alcohol and drug problems and her rehab with honesty. She reappeared as a fierceless General Leia Organa in Star Wars Episode VII - The Force Awakens (2015): the film gave her the chance to be once again part of the beloved saga, but opened old wounds as, in interviews, she criticized Hollywood for its obsession with appearance and the way the film industry treats women, revealing she was requested to lose weight when she played Leia in the original Star Wars films and in the 2015 sequel. The actress finished filming on Episode VIII (due to be released next year) before she died and digitally manipulated footage of her is included in Rogue One: A Star Wars Story (2016). Fisher is survived by her daughter Billie (from her marriage to Bryan Lourd), an actress like her, her brother Todd, and her mother Debbie Reynolds, who is 84. Leia's first costume - her white princess gown and her hairstyle had an impact on the fantasy of millions of fans (check out how many crocheted hats the "hairy earphones" style spawned...), including fashion designers. So while the padded clothes for icy planets in The Empire Strikes Back were less inspiring and the slave bikini in Return of the Jedi was simply outrageous (still, killing a huge and disgusting space slug in an outrageous bikini was no mean feat…), the white virginal robe (by costume designer John Mollo) often reappeared in different versions (at times matched with the trademark buns...) on many runways and collections, including Balenciaga's S/S 2007 (the collection with the robotic C-3PO leggings, remember? ), Givenchy's S/S 2013, Carolina Herrera's A/W 2013, and Ter et Bantine's A/W 2015, not to mention the many tributes that Star Wars received from the '70s to more recent years and, after the 2015 film, also from a younger generation of fashion designers, including Rodarte). In The Princess Diarist Fisher also states that, as the years passed, she and Leia melded into one and, in many ways, she was right. It is indeed impossible not to think about the former without picturing the latter running down the corridor of a spaceship, viciously answering back Darth Vader or quarrelling with actor Peter Cushing as Grand Moff Tarkin, being surrounded by stormtroopers or appearing like a ghost as her hologrammed self while stating: "Help me Obi-Wan Kenobi, you're my only hope!" The best thing about our beloved space princess though wasn't just her look or her hairstyle but the way she stood up to her male counterparts. "As much as I may have joked about Star Wars over the years, I liked that I was in those films. Particularly as the only girl in an all-boy fantasy. They were fun to make," Fisher stated in the introduction to The Princess Diarist. Will Fisher be digitally resurrected in the next films as it happened to Peter Cushing/Grand Moff Tarkin in Rogue One? We'll see, but, for the time being, it was Fisher herself who pronounced the most prophetic words about her own self. In her latest book she wrote: "The hairstyle that was chosen would impact how everyone – every filmgoing human – would envision me for the rest of my life. (And probably even beyond – it's hard to imagine any TV obituary not using a photo of that cute little round-faced girl with goofy buns on either side of her inexperienced head)." This cover of Italian magazine Bella (1st December 1955) shows a streamlined beige wool suit matched with a very cute architectural hat. The suit was designed by Ronald Paterson and, though simple, it looks strikingly elegant with a linear motif around the hips and the front. The jacket was enriched with a luxury touch - a beaver and lamb collar. The straight skirt was actually a sort of subtle hobble skirt since it was tapered at the hem. This detail was launched by Paterson to give wearers the "Paterson Walk", with hips and stomach out, chest in and shoulders hunched forward. Born in Scotland, Paterson (1917-1993) studied at the Piccadilly Institute of Design in London and trained in Paris. In 1947, he opened his own couture house and had a lot of success in the following 20 years; his fashion house closed in 1968. Paterson also worked as a fashion consultant to a number of films, including The Adventurers (1970) and The Spy Who Loved Me (1977), both directed by Lewis Gilbert. In the '50s Paterson seemed to have a penchant for basque style berets, at times matched with dark silk coat-frocks. This hat is particularly interesting since the beret is formed by a swirling felt motif and the little "tail" on the top has been transformed into a three-dimensional little tower. The accessory perfectly completes this rather architectural look. As you may have heard by now, singer George Michael died yesterday at 53, from heart failure. As it happens in these cases messages of condolences started flooding the Internet, accompanied by iconic pictures of his best years. Michael rose to fame as half of Wham! (with Andrew John Ridgeley) known for their hits "Club Tropicana" and "Last Christmas", and then had a successful solo career. Quite often we forget that fashion contributed to shape and promote the identity of a band. In the case of Wham! Katharine Hamnett played an influential role. In the early '80s Hamnett produced simple oversized white T-shirts with political and ethical slogans printed in large big and bold black letters. Wham! first opted for a "Number One" shirt, going for "Choose Life" in their video "Wake Me Up Before You Go Go" (while vocalists Pepsi and Shirlie wore the "Go Go" slogan T-shirts). The slogan - originally directed at drug abuse and suicide (but later on used by the pro-life movement against abortion...) - was then transformed by the duo into "Choose Wham". After George Michael went solo, he released in 1990 the track "Freedom '90". As a reaction to fame, Michael didn't want to appear in the video, but, inspired by Peter Lindbergh's portrait of Naomi Campbell, Linda Evangelista, Tatjana Patitz, Christy Turlington, and Cindy Crawford for the January 1990 cover of the British edition of Vogue (View this photo), he asked the five models to star in it. Directed by David Fincher, the team for this video included clothes stylist Camilla Nickerson, who then became a Vogue contributing editor, hair stylist Guido and makeup artist Carol Brown. At the end of his A/W 1991 runway show in Milan, designer Gianni Versace sent Crawford, Evangelista, Campbell and Turlington down the runway. The four models stood in a huddle, mouthing along to "Freedom", this show became a pivotal moment in the supermodel era. Evangelista was cast again in George Michael’s 1992 "Too Funky" video, this time she was joined by top models Nadja Auermann, Tyra Banks and Estelle Lefébure, plus iconic performers à la runway coach/model, stylist and fashion illustrator Connie Fleming. Michael hired fashion designer Thierry Mugler to shoot the video who injected in it all his passion for theatrical costume drama. Check out Emma Sjöberg-Wiklund in Mugler's motorcycle outfit and robot costume; Julie Newmar as a midinette who goes mad; Evangelista as a superhuman alien in white and Joey Arias in the part of the crazy couturier inspired by Edith Head, wearing a pleated chiffon skirt with a pearl corset, a tight black knit sweater and fetish shoes. The video was made for charity (and the people involved worked for free). As yesterday was 25th December, many fans paid homage in tweets reposting Wham's single "Last Christmas". In a way there was something about fashion in this video as well: the lack of pretentious clothes and luxury cases replaced by casual garments and anonymous sport bags. You can bet that, if it had been shot today, this video would be a great opportunity for product placement. Michael's death sadly marked for his family, friends and fans his very last Christmas, but surely not the end of the fashion and music connection. There are millions of images ideal to celebrate Christmas, but paintings depicting the Nativity of Christ are definitely among the best ones since they show a miraculous event seen through the eyes of an artist. The image illustrating this post shows for example Fra Bartolomeo's interpretation of the Nativity (1504-07). Bartolomeo Domenico del Fattorino - nicknamed Baccio della Porta - was born in 1473 and was active in Florence in the first years of the 16th century. He abandoned his artistic career for a few years when he joined the order of ardent Dominican reformer Savonarola, as Fra (Friar) Bartolomeo (or Bartolommeo) in 1500, but returned to painting in 1504, injecting in his works a sublime spirituality. He mainly painted religious subjects, working in the convent of San Marco in Florence and became one of the four most important artists of the Italian High Renaissance together with Leonardo da Vinci, Michelangelo and Raphael (he was Florence's most important painter until his death in 1517). At the moment Fra Bartolomeo is being celebrated at the Museum Boijmans Van Beuningen in Rotterdam through the exhibition "The Divine Renaissance" (until 15th January 2017). The exhibition is a particularly important event since this is the first time that paintings by Fra Bartolomeo were reunited with preparatory drawings (the Museum Boijmans Van Beuningen owns the world's largest and finest collection of Bartolomeo's drawings). His sketches show figures in various poses: Fra Bartolomeo made use of a life-size mannequin (a wooden doll with removable parts and movable joints) and also employed wax and clay models of children - for the Christ child or cherubs - and individual limbs. He paid particular attention to the drapery of the robes of his characters and draped fabric over the mannequins to study as closely as possible the play of light on the drapery. His passion for these details is clear also in the fabrics of the robes of the Virgin Mary and St Joseph in this Nativity scene. Merry Christmas to all readers! Nowadays it is not rare to stumble upon piles of old newspapers and magazines or even unwanted books. You can't rescue everything and most stuff including old and colourful encyclopedias so dated to be practically useless often get destroyed, yet they can still be recycled or transformed into something else. This is what I did a while back when I made this simple necklace using paper (a circle puncher is a useful tool to make this design) and some large wooden beads. I reused the idea for a project in collaboration with a state school in Italy: a class of primary school kids made four necklaces for their teachers as a special Christmas present. The paper came from books destined to be recycled, but then the kids hid some cute messages and drawings inside the necklaces as an additional surprise. Everybody seemed happy about the final result: kids felt they took part in a collaborative effort while teachers rejoiced when they received a conceptual handmade gift by their pupils. By recycling paper and adding their personal messages kids were allowed to tell a story about themselves, while learning that a valuable piece of jewellery doesn't have to be made of gold, but it certainly must be made with your heart. "The apparel oft proclaims the man," claims Polonius in Shakespeare's Hamlet, but Mark Twain elaborated the concept further when he stated "Clothes make the man. Naked people have little or no influence on society." This statement is the opening slogan of the free exhibition "ManMode: Dressing the Male Ego", on display until today in the History Gallery of the FIDM Museum, Los Angeles. The event explores three centuries of menswear, via several mannequins, plus a selection of garments and accessories from the FIDM Museum collection. The ensembles present clothes from a man's wardrobe selected from different centuries and project boldness, confidence or vanity via bright colours, sharp silhouettes or decorative embellishments, embroideries and prints. There are quite a few highlights from past centuries including a three-piece court suit worn by Austrian musician Johann Hummel (c. 1810-1814) and an early 19th century coat worn by the Royal Company of Archers in Scotland (c. 1822). Rather than being practical and functional like modern athletic wear, this rare piece is characterized by a fashionable silhouette influenced by King George IV's (1762-1830) interest in fashion. The coat - in a "Sherwood Forest" green shade referencing the stories of Robin Hood and his archers and featuring crossed arrows in the center of each gilt button - wasn't actually designed to be worn on the playing field, but at a formal occasion such as the Archery Ball. Victorian fashion is represented by a tailored evening suit by Basel Durant, and by a robe incorporating intricately colourful paisley embroideries from 1867. Some garments offer food for thought to visitors via clever juxtapositions: two outfits from 1969 - a Space Age jumpsuit by Ruben Torres (the Los Angeles Times wrote about it: "The man in the space suit this fall need not be an astronaut, he might just be your banker or your broker.") and a caftan by Rudi Gernreich - represent two sides of the coin, technology and the Space Age and hippy fashion. A robe with matching swimming trunks with prints of athletic divers from 1938 sits next to a bright orange ensemble with inflatable inserts by Issey Miyake (S/S 2001 collection); Ralph Lauren's denim trousers covered in squares of different fabrics to create a patchwork effect are displayed next to a pair of see-through PVC pants by Alexander McQueen, while metallic leather and silk brocade boots from 1895 (possibly by Harry William Morris) sit next to their more modern counterpart by Lincoln's New York (2007). Visitors with a passion for graphic design will enjoy the logo ensemble by Stephen Sprouse, while fashionistas will be able to rediscover a 1993 vest by Gianni Versace with an exotic Baroque print and an Amish inspired ensemble from Thom Browne's Autumn/Winter 2013-14 runway, complete with accessories (hat, quilted cape and case) not sold in stores. Inspired by Browne's upbringing in rural Pennsylvania, the outfit features specific Amish references in the low-fitting hat, grey colour palette, quilting and star motifs, traditionally used to decorate barns. There are some curious and novelty items on display as well, such as a pair of ironic boxer shorts with prints of pin ups opening the fly as if it were a curtain. The most stunning piece in the exhibition is a rare smoking jacket made of cigar silks (sometimes you stumble upon such pieces at vintage stores or at antiquarian shops and auctions - they can easily reach several thousand pounds...). This is a fascinating piece that can be dated from around the 1880s, when it was popular to construct garments from silk cigar bands used to tie bundles of tobacco products. The silk bands came in different colours and featured the brand name imprinted. Women often collected these silk fabrics for quiltmaking and other sewing projects, so this piece is not just a flamboyant display of male's ego, but a testament to the patience and skills of the craftsperson (maybe a woman?) who made it, collecting all the bands and then matching and stitching them together in a visually striking composition. Influential, inspirational and controversial. These three adjectives perfectly describe and define Franca Sozzani, the editor-in-chief of Vogue Italia, who died today in Milan after a year-long illness. Jonathan Newhouse, Condé Nast Chairman and Chief Executive, announced her death stating: "This is the saddest news I have ever had to report to you." He added in his message to Vogue readers and fashion fans all over the world: "Franca was one of the greatest Editors who ever made a magazine. She was by far the most talented, influential and important person within the Condé Nast International organisation. She made Italian Vogue a powerful and influential voice in the worlds of fashion and photography by publishing ground-breaking photography and journalism. In doing so she expanded Vogue beyond what had been the traditional model of a fashion magazine and often courted controversy by doing so. The greatest fashion photographers looked to Franca as the creative leader who would give them the freedom and the scope to produce their best work and they did so, month after month." Born in 1950 in Mantua, Sozzani studied literature and philosophy in Milan, marrying shortly afterwards. She divorced three months later while pregnant with her child, Francesco. A stint in Britain allowed her to taste the freedom of the Swinging London scene and, upon her return to Milan, she applied for a job at Condé Nast. She worked as a secretary, and then moved to Vogue Bambini. By 1980, she became editor of Lei (an early version of Glamour magazine) and then of Per Lui (aimed at the male market). Appointed Editor in Chief of Italian Vogue in 1988, she became in 1994 Editor in Chief of Italian Condé Nast. Sozzani revolutionized Vogue publishing controversial shoots by her favourite photographers to whom she gave editorial freedom. She knew indeed that powerful images would have helped the magazine circulation, reaching out to a wider audience of readers and fashion fans who didn't speak Italian. She therefore proceeded to transform the magazines she directed through exclusive shoots by famous photographers such as Mario Testino, Paolo Roversi, Herb Ritts, Peter Lindbergh, Bruce Weber, and Steven Meisel, who became one of her closest collaborators. Throughout the years Sozzani became the centre of controversy for editorials that provoked debates as they focused on the modern obsession with plastic surgery ("Makeover Madness," July 2005), reinterpreted the 2010 BP oil spill, or opposed domestic violence while showing women stalked by killers and murderers (Steven Meisel, April 2014; the shoot looked more like a nightmare out of a Dario Argento film rather than a way to comment on domestic violence, it was indeed entitled "Horror Movie"...). In 2008 she produced an all-black issue featuring only black models, followed by a plus-size issue and featured Kim Kardashian on the cover of L'Uomo Vogue in 2012, opening the doors of the fashion world to the superficial icon before US Vogue embraced her. Sozzani embodied a trend that started after the '80s when magazines became extremely respectful of the fashion houses advertising in their pages (this trend contributed to damaging the Italian fashion scene lacking integrity and criticism). Sozzani was also criticised for multiple conflicts of interests: her niece Sara Maino (daughter of Franca's sister, Carla, founder and owner of concept store 10 Corso Como) works at Vogue Italia; she favoured her son, Francesco Carrozzini, who for years was the only Italian photographer working for the magazine, and her partner, Vogue Italia/L'Uomo Vogue art director Luca Stoppini who also directs an advertising company and takes care of the campaigns of quite a few fashion houses and brands appearing on Condé Nast magazines. In more recent years Sozzani appeared at public events (she addessed Harvard's student union on fashion's approach to body image), wrote (in a quite often bland and superficial way) about a variety of issues in her blog on Vogue.it and supported the competition for emerging fashion designers "Who's on Next? ", in an attempt to prove Vogue Italia wasn't just siding with famous fashion houses, designers and brands (with advertising budgets...) but was also interested in younger talents. Sozzani became the creative director of Convivio, the AIDS initiative that Gianni Versace launched in 1992, global ambassador against hunger for the United Nations World Food Programme and UN goodwill ambassador, and president of the European Oncology Institute, founded by Italian oncologist Umberto Veronesi. She received the Swarovski Award for Positive Change at the 2016 British Fashion Awards that took place in London at the beginning of December. She is survived by her son Francesco Carrozzini, who shot a documentary about her, "Franca: Chaos and Creation" (a title inspired by a description of her approach by Bruce Weber), screened at the Venice Film Festival in September. Carrozzini is dating Bee Shaffer, daughter of Anna Wintour, US Vogue editor and artistic director for Condé Nast. Bets are now open about who will take Sozzani's job: it will indeed not be easy to find another powerful figure like her and, while it would be interesting to see where Vogue Italia would go without anybody related to Sozzani at its helm, the magazine risks to remain "a family affair", with Carrozzini, Shaffer and Maino in pole position as potential candidates.